A longitudinal neuroimaging study shows distinct differences in left-hemispheric networks in children who stutter compared to those who do not. Children who stutter are more likely to have reduced cortical thickness in the left motor and lateral premotor cortical regions of the brain than those who don't stutter or those who once did but have regained smooth speech patterns, according to a report published in the July 31 online edition of Brain. The findings point to a deficit in the left hemisphere speech network in children with persistent developmental stuttering and further, a possible compensatory mechanism involving the left medial premotor cortex (PMC) in those who recover from childhood stuttering. “This is the first study to find such links based on surface-based measures of brain morphology in young children close to stuttering onset,” study author Soo-Eun Chang, PhD, the Rosa Casco Solano-Lopez Research professor of child and adolescent psychiatry and assistant professor of psychiatry at the University of Michigan, told Neurology Today. Dr. Chang and her colleagues obtained magnetic resonance imaging scans from 36 children who stuttered and 34 control subjects aged 3-10 over a period of up to four years. They measured stuttering using the Stuttering Severity Instrument. Among the 36 children who stuttered at their baseline visit, 11 children recovered over the course of the study. The researchers found that in the lateral PMC, the persistent stuttering group displayed decreased cortical thickness in the ventral PMC compared to the control group and in the middle PMC compared to both recovery and control groups (p=0.005). In addition, the results showed significant group differences with the local gyrification index (LGI), which measures the level of cortical folding, in left medial premotor cortical areas. This included a decrease in LGI with age in the left supplementary motor area (SMA) of the recovery group but not the control or persistent groups, and lower LGI in preSMA in the recovery group compared to the control and persistent groups. “The children who would eventually recover showed decreased gyrification in the left SMA/preSMA, which we tentatively interpret as a possible indicator of improved long-range connectivity with other cortical and subcortical areas that may help achieve fluent speech production,” the authors wrote. Dr. Chang added that these latter regions are “critical speech planning areas” that exhibit decreased cortical thickness in children with persistent stuttering. It is possible that greater connectivity between the SMA/preSMA and the inferior frontal gyrus areas could be a compensatory development that helps children to grow out of stuttering. More research is necessary to address successful treatment for stuttering at this stage, she said. The study was funded by the National Institute on Deafness and Other Communication Disorders. Commenting on the study, Anne L. Foundas, MD, FAAN, executive director of the Brain Institute of Louisiana and research professor in the department of communication sciences and disorders at Louisiana State University, highlighted three important takeaways from the study. “First, this longitudinal neuroimaging study shows distinct differences in left-hemispheric networks in children who stutter compared to those who do not. This is important because a study of brain structure in children close to the onset of stuttering symptoms has the potential to determine whether brain differences represent a neural risk. This question cannot be answered in studies of adults who stutter,” Dr. Foundas told Neurology Today. “Second, the authors were able to separate the stuttering group into those that recovered versus those that continued to have a persistent problem. The idea is that if these subgroups differ from each other, and if the recovered group is more like the fluent control group, then the distinct anomaly may be a biological marker of stuttering rather than a change associated with the persistent stuttering behaviors,” Dr. Foundas said. She noted that the persistent stuttering group showed reduced cortical thickness in the ventral premotor cortex relative to the other groups such as recovered stutterers and controls, and that the cortical thinning became more pronounced over time. “It is interesting that the most distinct differences were in left-frontal motor regions, as prior studies have shown abnormal changes in the underlying left frontal white matter pathways in both adults and children who stuttering. This convergent evidence provides further support for the notion that disrupted left-brain networks may be a neural risk for stuttering,” Dr. Foundas said. “Finally, this is the first study to examine a gyrification index in a longitudinal study of children who stutter. This index probes whether a distinct region has more cortical folding compared to another,” Dr. Foundas said. She pointed out that the recovered group showed an age-related decrease in local gyrification in the left medial premotor cortex, including the SMA and pre-SMA. “These regions play a role in speech preparation and planning. An uncoupling of these networks may occur within motor planning/preparation in persistent stuttering, and these changes in left medial motor cortex may represent a compensatory mechanism in children who recover,” she said. The study authors nicely reviewed the literature on stuttering and recognize that many children outgrow their stutter, although some do not, he said. He agreed that the findings offer important clues about the brain morphology of stuttering, in particular, the authors' suggestion that the left medial premotor cortex is important in assisting recovery in stuttering. Dr. Peterson reported receiving an honorarium and travel expenses from Shire Human Genetic Therapies, and received both an honorarium and travel expenses. The other sources reported no conflicts of interest. •. Garnett EO, Chow HM, Nieto-Castañón A, et al Anomalous morphology in left hemisphere motor and premotor cortex of children who stutter https://academic.oup.com/brain/article-abstract/141/9/2670/5062920. Brain 2018; Epub 2018 Jul 31. 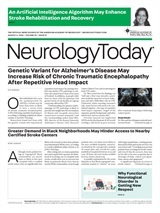 Neurology Today18(18):10-12, September 20, 2018.